When a handful of MIT graduates get together to solve a problem, amazing things can happen – in this case, the most disruptive order fulfillment system to enter the industry in more than a decade. Kiva Systems founder and CEO Mick Mountz (SB ‘87) and CTO and technical co-founder Pete Wurman (SB ‘87) were roommates as MechE undergraduates at MIT and fellow members of the Sigma Alpha Epsilon (SAE) fraternity. Together with technical co-founder Raff D’Andrea, they developed Kiva’s revolutionary real-time order fulfillment solution combining robotics and a highly adaptive algorithm-intensive enterprise software application. Soon thereafter, VP of hardware Matthew Verminski (SM ‘98), VP of product and program management Benge Ambrogi (SM ‘87) and engineering fellow Pete Mansfield (PhD ‘90) joined the start-up. The Kiva System – the first version of which was built in 2004 – is a suite of simple yet dynamic robots, complex back-end algorithms, and a touch-screen application that makes the whole system comprehensive and easy to navigate. From the time you submit an online order until five minutes later when the order is ready to ship, the Kiva System finds the ordered items and brings them to the pick station. Before Kiva Systems, order fulfillment was often a long, manual process that could easily prevent a company from becoming profitable. That was exactly the case with Webvan, the company Mountz worked for prior to starting Kiva. Webvan was an Internet grocery delivery startup with a fulfillment rate of about 50 units per hour. Mountz made it his mission to find a more efficient and productive process for fulfillment. “We set out to build a system that could do 600 units per hour,” he continues. “The problem was clear: We needed to get ‘red,’ ‘green,’ and ‘blue’ in the box. We started brainstorming from a blank sheet and asking ourselves very basic, almost silly questions. ‘Why aren’t the units already in the box? Why didn’t the vendor just ship them that way? Why don’t the products just get in the box themselves?’ We didn’t constrain ourselves to traditional approaches or ways of thinking. In the end, Kiva’s solution, which can produce 600 units per hour, does indeed enable products to “walk” to the boxes themselves. Here’s how it works. A warehouse employee logs into the pick station through a touch screen. 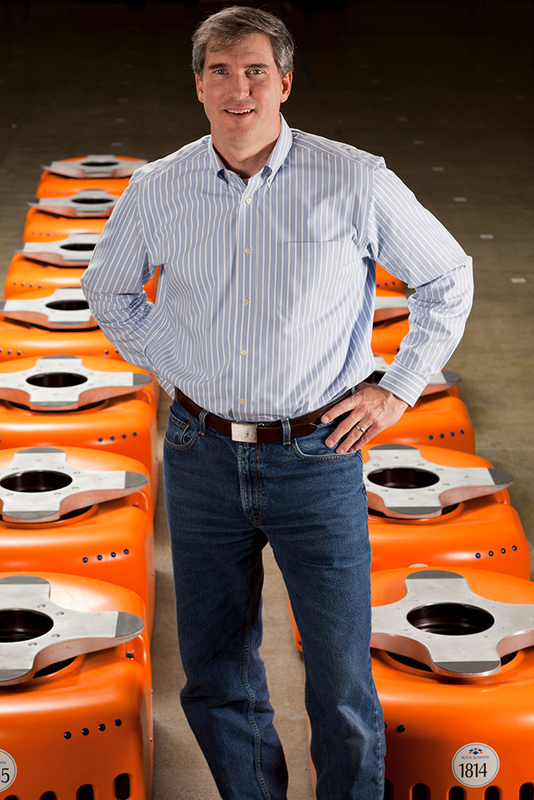 The customer order arrives in real time, and robots immediately begin moving toward a storage pod that contains the item. A navigation system on the warehouse floor consists of a series of stickers, which the robots take photos of along the way to keep them on a consistent path. Once the robot arrives at the pick station with a pod that contains the ordered item, a laser points to the individual cubby holding the item. The pick-worker takes it out, scans it, and places it into a tote for shipping. After the robot has delivered its cargo, it takes the pod to a new dynamic location in the warehouse where it awaits its next mission. All that and yet the Kiva System is incredibly simple, at least from the outside. The robot consists of thermoformed shells with sensors, injection-molded parts, cabling and harnessing, castings, motors, actuators, and gear boxes. The electronics bring it all together with embedded firmware and control systems. On the back end, software is engineered to distribute missions to the robots about what to fetch, from where, where to bring it, and how to get it there most efficiently.